Markets at 03:46 pm on 22-11-2011. Mumbai: Shares closed 0.75% higher on Tuesday on short covering, snapping an eight session losing streak, although the gains are seen as temporary as concerns over tardy policymaking and a falling rupee continue to weigh. The rupee skidded to an all-time low of 52.73 to a dollar on Tuesday as oil refiners and other firms scrambled to buy dollars, with the currency looking increasingly vulnerable to a swelling current account deficit and fears over the global economy and euro zone. The government is banking on the brief winter session of Parliament, which commenced on Tuesday, to kickstart its long-stalled policy reforms. However, analysts said decisive action was needed to create a meaningful rally. “This can be a corrective rally, a temporary arrest making place for the next fall; but whatever way you put it, we are not out of the woods," said Arun Kejriwal, strategist at research firm KRIS. 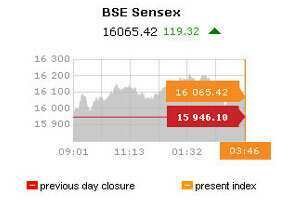 The 30-share BSE index ended up 0.75% at 16,065.42 points, with 18 of its components closing in the green. The benchmark, which is down about 22% this year, is among the world’s worst performing stock index. “After eight days of decline, you need a break. But I don’t think any of the issues for which the market has fallen has changed," Kejriwal said. Automaker Tata Motors led the gains, soaring 6.8%, while Maruti Suzuki, India’s top car maker, climbed 1.75%. The auto index, which had fallen 11.3% in November, added 1.08%. Short covering sent shares in HDFC rise 2.3%, while ICICI Bank and top lender State Bank of India rose 1.9% and 1.03%, respectively. The banking index, which has fallen 13.7% so far this month, rose 0.55% on Tuesday. Reliance Industries, India’s top listed firm, rose 1.13%, while tech giant Infosys Ltd jumped up 2.02%. The index has dropped 9.3% so far this month amid worries about the inability of the government to push through major policy decisions and slowing corporate earnings growth. “Action and decision need to be taken to change the current problem. Until that happens we will drift along with the rest of the global markets," KRIS’s Kejriwal said. Foreign funds have sold more than $300 million worth of shares over last week, reducing the net inflows in 2011 to just under $400 million, sharply below record inflows of over $29 billion received in 2010. The slide of the rupee to a record low is another factor piling pressure on local equities, analysts said. “I do not want to read too much into today’s recovery because it may be a dead cat bounce," said Jagannadham Thunuguntla, head of research at SMC Investments and Advisors. “The rupee has reached a level which nobody would have anticipated even three months ago. The RBI (Reserve Bank of India) is also indicating that this is because of market forces and they can’t do much about it," Thunuguntla said. Exposure to short-term portfolio flows, a rising oil import bill and slowing export growth have heightened the risk on the rupee and the outlook remains bearish. The 50-share NSE index ended up 0.71% at 4,812.35 points. In the broader market, 1.04 gainers outpaced every loser, on a volume of 605.3 million shares. Global stock markets put in gains on Tuesday after a heavy session of losses in the previous day, though the respite from worries over US and European government debt looked only temporary. The MSCI’s measure of Asian markets other than Japan was up 0.21%, while Japan’s Nikkei was down 0.40%. • Pipavav Defence and Offshore Engineering closed up 3% after the shipbuilder said it would issue shares to an international strategic investor on a preferential basis. The stock had jumped 10% earlier. • Titan Industries, which retails watches and jewellery, fell 6.5% after Citigroup started coverage on the stock with a ‘sell’ advice, citing unfavourable risk-reward profile due to valuations and choppy gold prices. • Shares in Force Motors jumped 15.9% after the vehicle maker said it would sell its shares in a joint venture for €150 million to its German partner MAN.